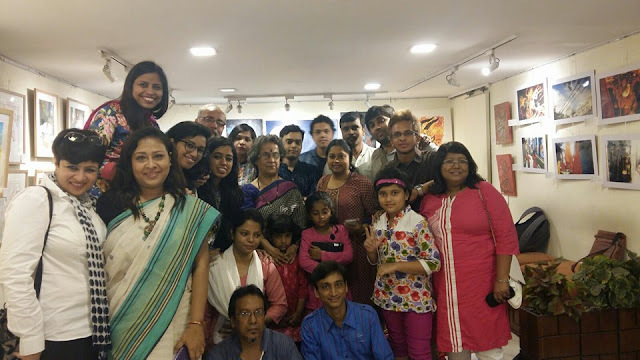 Dear Bookworms hope you had a wonderful pujas and an amazing Diwali. 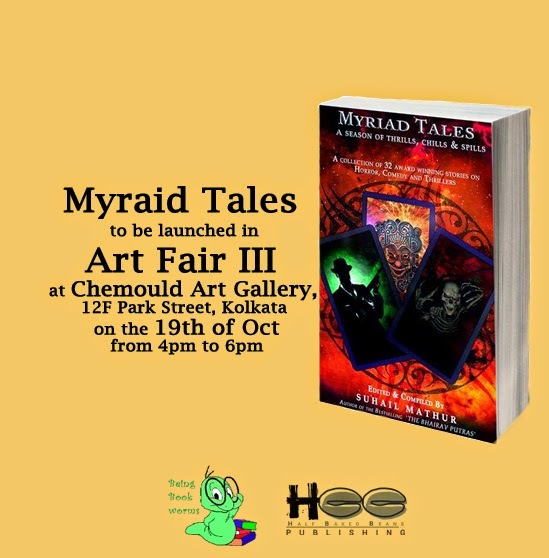 We are delighted to introduce to you one one of Myriad tales Kolkata authors so that you would be excited to meet him at the Myriad Tales Launch in Kolkata in Art Fair III on the 19th of oct 3pm to 5pm in Chemould Art gallery parkstreet following a musical performance by an upcoming band. 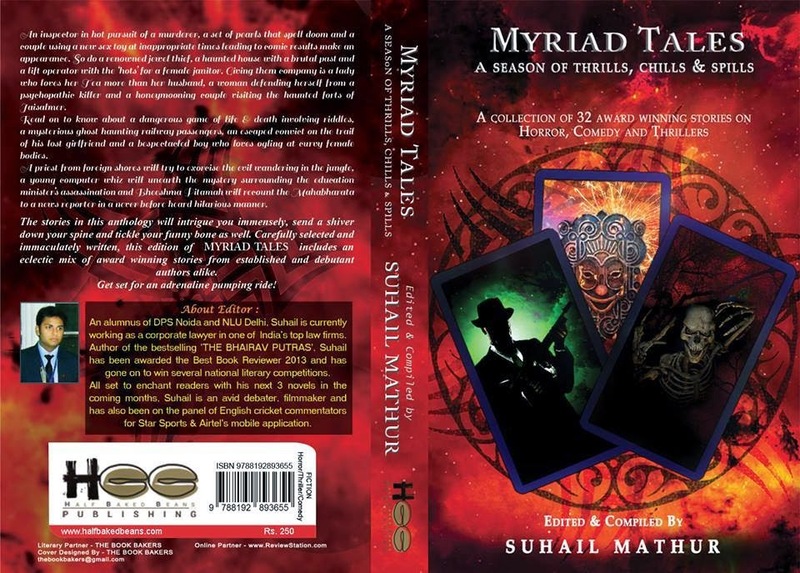 Myriad Tales edited and compiled by Suhail Mathur and published by Half Baked Beans.......is a book that was born out of an all India online short story writing competition where out of thousands 32 best stories were chosen and a book was born consisting of horror,thriller and comedy based stories.We all are excited for the launch and hoping to see you there. We wish Raviraj all the best for it. Q1: Tell us something about your story, how did you chance upon the contest? A: My story, RAPED, is about an innocent girl Vaani. She has an obsession of watching crime based serials, which, according to her, will be helpful in future if at all she is trapped into a situation like that. My story stresses upon the thinking of a girl when she actually endures a situation like that, and how she reacts to it. Through facebook, I knew that a contest is being held, but it was on Himani Ma’am suggestion did I dare to participate in this competition. And thus, this was the first Anthology competition I participated in, and luckily my story got selected. Q2: What was like winning this contest? How many anthologies have you participated? A: Winning a completion always feels wonderful. This being the first literary completion I participated in, I am excited. My happiness knew no bounds when I received the e-mail of my short story’s selection for Myraid Tales. So far I have participated in two Anthologies. Q3: Do you think anthologies are a good opportunity for young authors to try their hand in the skill of writing? A: Definitely! Through competitions like this, they come to know where they actually stand and the reviews they receive, it shows them their shortcomings and the areas they need to work upon. Q4: How do genres help in building the writing skills? A: The power of imagination is everything. Till you don’t imagine how a scene you are going to write appears in your mind, you can’t pen it down. The genre you choose to write upon cannels your imagination, and the rest are words, through which you present your imagination on paper. At least that’s what I went through when I wrote my story, RAPED. Q5: What is your way of going about a story? Do you think of a plot first and then build on it or visa-versa? Is there any formula to a successful-emotional romantic story? Which genre you like to write on? A: To write a story, first I decide what emotion I need to express. Then, I recall incidents from my personal life that had made me go through a similar situation. You know, I am twenty years old, so sometimes I borrow it from the words I have heard, at times rumors, and sometimes experiences of others. Combining all, I make a rough sketch of how the proceedings of the story should be. Once I prepare the skeleton, rest are the words played to gear up with the need of the story, the emotion I need to put through my words, and there is where I put my imagination to play. Well, frankly speaking, I have no idea about writing a romantic story. Hahah! I like to write a tragedy. Q6: What do you have to say about the Myriad Tales team Suhail, Chetan and Himani? A: The trio is putting in their best efforts to bring up a book very different from the anthologies released so far. All are equally dedicated and the best thing is, since we know about every proceedings of the book, they are not compromising with the quality of the book. I can definitely assure that the book will feel great on the hands of the readers and it will of course be worth reading. Q7: Any message from a reader that made you inspired to write more? A: It was BEING BOOKWORMS that first reviewed my short story-SHE, and being stated the best story of the book, nothing more could inspire me to keep on writing. Q8: Tell us something about your childhood? Recently the trend of engineers/ca/other corporate or medical aspirants taking up writing seriously has been emerging? Is it because of Chetan Bhagat's success or something? What made you leave engineering and write? A: My childhood has been full of experiences. I have done my schooling till sixth class from St. Xavier’s Sahibganj, from there I moved to Sainik School Korukonda, Andhra Pradesh, where my life for the next five years was under strict military discipline. And I would definitely give it the credits of making me the somewhat writer I am today. It will be ironic to say, but I had started writing in Hindi from my sixth onwards there and went on to think to be a Hindi writer someday. The next two years I spent was in G.G.P.S. Bokaro. And the two years of my life there, only one word can sum it up, Unforgettable. Chetan Bhagat had invoked the idea of, that everyone can be an author, though he might have not though the same when he penned down his first novel. 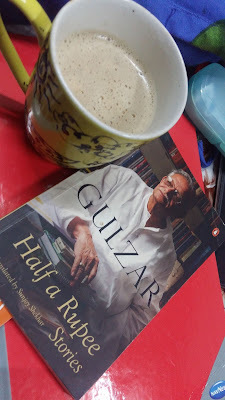 Yes, he is a craze; in fact, the first novel I read was Chetan Bhagat’s. I wrote the first draft of my novel, on my friend Sayantan Chatterjee’s insistence, after I completed my first year exams. I definitely found it difficult to type, I was doing it for the first time, but as time passes, two months maybe, I have written some sixty thousand words, and that time I realized, I can write and write on forever. I never scoffed at the laptop, “Oh! I am tired, I can’t write anymore.” That time I decided, this is the one for me, and to make myself better, I need to study something related to it. 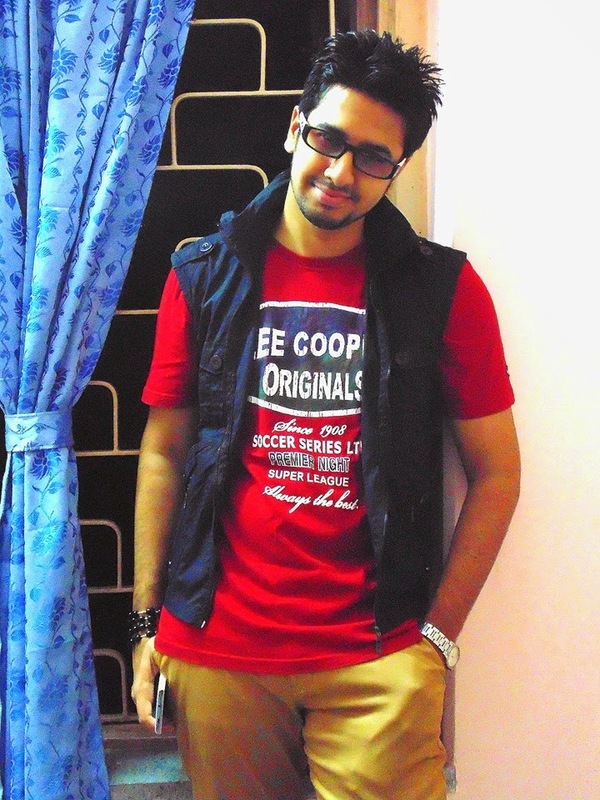 So I joined University of Calcutta to pursue my English Honors and fortunately it was the last date to register. And my parents, I am sincerely thankful to them, for without their support I couldn’t take this step. Q9: What is in writing that really draws an author? Q10: How good has been participating in anthologies? Recently we have seen many traditional and self publishing anthologies coming up through competitions so how efficient are they, anything that you have experienced that can suggestions. A: As I said, participating in anthologies say where you stand in the competition. Publishing world, nowadays, has become a competition. You will have to make a mark. There are no recommendations, here. You start from zero, and if you are capable enough to move a reader’s heart, there you are, on the top. Q11: How has been the response from your friends? A: First of all, they never expected me to be an author, and yes, they loved my first short story. I am sure they will like this one, too. Q12: Do you think Being bookworms by supporting authors, books, and other literary events are creating a new opportunity for good authors to interact with their creative side and bring readers more closer to them. A: Definitely! Knowing an author’s perspective is important, and BEING BOOKWORMS brings that to a read through interviews like this. And giving a young somewhat author like me a chance to put forth my ideas to the readers, I am overwhelmed. A firm like this muse be encouraged.